Two Decembers ago, I unwrapped a gift from my office Secret Santa to find a paint-your-own-cat mug and a nine-foot iPhone charging cable. The mug, uh, wasn’t long for this world — I hate cats, so it was mostly a joke anyway — but the cable turned out to be one of the best gifts I’ve ever received. As much as I’d like to be one of those holier-than-thou types who sleeps with her phone silenced in a different room … I’m not. If I’m being fully honest, most nights I sleep with my phone on my pillow, or even in my hand, with the volume turned all the way up. You know, just in case my parents, or Hillary Clinton, or a teen with a hot meme tip needs to get ahold of me at 2 a.m. Before I was given an extra-long cable, this meant I’d charge my phone all day at the office and hope the battery would hold out long enough to ensure that my alarm would go off in the morning. Or if I hadn’t charged my phone enough, it meant plugging my phone into the wall with my Apple-issued cable and then contorting my body — or worse, getting out of bed — every time I wanted to check it throughout the night. Now, I just plug my phone in, stretch the cable, with its ample slack, to my pillow, and pass out. At least until my phone goes off. The long charger does more than just enable my, admittedly, bad sleep habits. It’s great for those times when you want to use your phone while it’s plugged in — when your battery is running low or you’re binge-watching something — and you don’t feel like seating yourself two feet from an outlet. 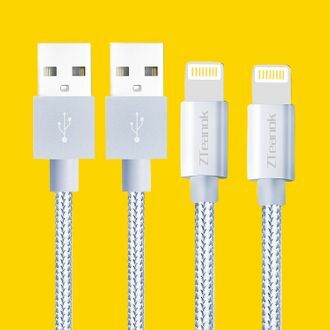 (Our friends over at the Strategist have sung the praises of the superlong charger in the past.) Apple’s standard charging cables ought to be this long, but since they aren’t, you can take this as an opportunity to buy a genuinely useful, and fairly cheap, gift for every iPhone owner you know. If you want to get crafty, you could even use it to tie as a bow around another gift. But honestly, the charger is probably enough.